Protecting a lead? 5-3-2 might do the trick. Not wanting to take too many risks going forward and keeping it fairly tight in the back is this formation in a nutshell. Got too many John Terry's you don't know what to do with? First, hide your best friends wives, ya I went there. Next sort out your back line by being able to play all of them with this fairly defensive set up. 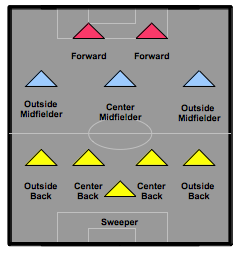 Compare and contrast pro sides formation that resemble this one and see how to plug into your own team's mentality. Variations and player responsibilities listed help in creating a uniform analysis of the formation. To be honest you will not see any pro teams these days line up with five in the back, completely unheard of. If anything they will have two holding defensive center midfielders but almost never five in the back. Putting that many in the back is showing some serious respect for your opponents. Not only respect but you're also asking to be peppered with an attack all game long. The most common time you'll see the line up of 5-3-2 is if one team is playing another team where they feel they have no chance in heaven of winning. Lining up with five is saying we want a low scoring game and try not to punish us too badly please. You're better off going for it with an all out attack then sitting back so much. But if you think that this will do it then play with four flat and one in behind. The other team will get the message that you're playing conservatively and are willing to sit in your half with eleven behind the ball for the full ninety. -Goals win games, and they are tough to come by in a 5-3-2. -The lack of flank threat in this formation makes it difficult for midfielders to get wide. In the case they get pulled out wide the objective is to retain the possession of the ball and look to play more central or forward. This set up gives little attack with the three midfielders and two strikers, but goals can still happen. If the outside backs get involved going forward then you can increase your chances of putting the ball in the back of the net. Typically (not always) sitting with this many back can pull your opponent deep in your end thinking they have nothing to protect behind them. That's when you hit them with the counter your conservative formation just picked your side up the victory. The 5-3-2 is very rare in modern football but you don't get anything out of being ordinary.